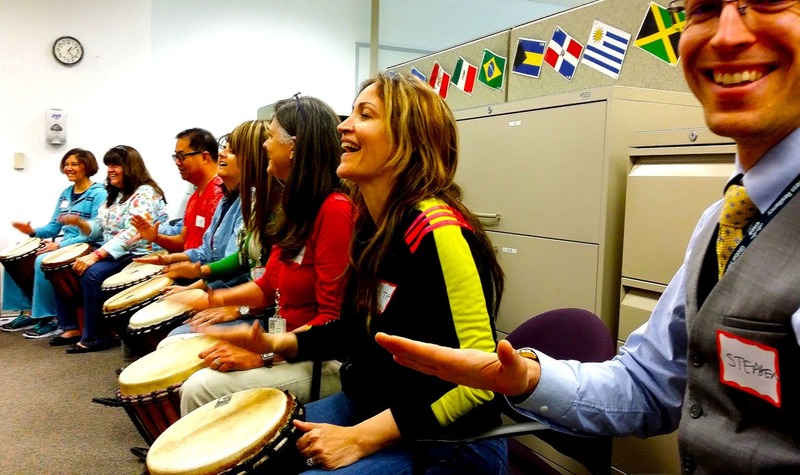 This unique and creative team building drumming workshop focuses on the value and importance of relationships in the workplace. It is proven that healthy relationships among team members are a contributing factor to improving performance. Ultimately, this team building workshop will help build a healthy unified team inspiring innovation and stimulating creativity. Drumming is a rare “Whole Brain” activity that encourages creativity by activating both sides of the brain simultaneously. Drumming workshops make great team building activities for businesses, corporations and other groups. Contact us to learn more about team building workshops in the Lake Tahoe and Reno areas. – Sylvia, Cisco Systems Capital team member. Cooperation, Communication and Consideration are a few focus points demonstrated and reinforced within the drum circle through the exploration of rhythms on the West African Djembe drum. We play, we listen, and we experience together the importance of our team connection while building a steady, cohesive musical drum circle. It’s powerful, purposeful and really fun!! “Your workshop was the highlight of the weekend!!! Thanks so much…you are a gifted teacher and a badass musician. I look forward to introducing others to your many gifts.” – Kevin Pratt, The Pratt Co.
– Sandra, Cisco Systems Capital team member. 1-1.5 hour, half or full day workshops are available. Drums are provided. You provide the chairs and a space for the drum circle to be created. No prior experience needed. Please contact me for more information about a team building workshop for your business, corporation or organization in the Lake Tahoe or Reno area.